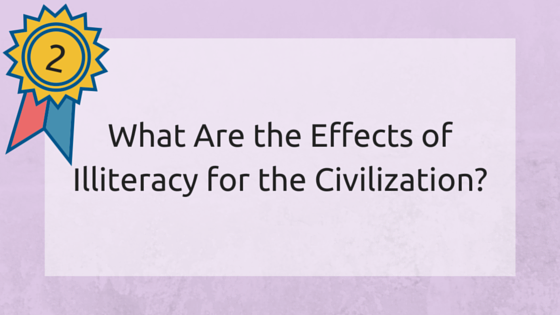 What Are the Effects of Illiteracy for the Civilization? Bertolt Brecht did not define illiteracy as a hallmark of a whole nation or society. His arguments were focused on the individual. However, the practices of statistics, which are skillfully collecting data and turning people into numbers, show that when illiteracy gains momentum among individuals in a certain society, the system corrodes. The cause of illiteracy is a system of connected vessels. We are mostly illiterate because we don't love our language, we don't read, we don't have access to high-quality translations of foreign literature, and we do not care about important financial issues. The effect of general illiteracy can be summed up with a single word: assumptions. People base their opinions and arguments in conjectures. As a result of their lack of interest and proper information, the results are visible on civilization level: the majority of people are political illiterates that undermine the system and leave space for corruption and authoritarian regimes labeled as democracies. Literacy is an important characteristic of every human being. We can determine one's depth and knowledge when we analyze the books they read. Each book becomes part of our subconscious mind and helps us determine the goals and values in life. Today, people have access to an immense collection of books they can choose from. Classics are more available than ever, but most of them opt for questionable popular literature that makes them blunt and impressed by the wrong human characteristics. People of all generations have a sufficient level of literacy to read Fifty Shades of Grey, but they lack the focus to read the subtitles of an artistic European movie. The careless attitude towards language and learning has become a problem of our civilization. It's even fashionable to be illiterate. The Russian subculture called 'padonki' has adopted an anarchic attitude towards their native language. They do not respect the established norms of spoken and written expression, so they twist and shorten the words in whatever manner that seems appropriate to them. The only rule is that there are no rules to follow. This example paints a clear picture of today's culture: literacy is no longer a primary value. The resistance to learn and comply with cultural norms is fashionable, and political structures gain tremendous benefits from such attitude. The world of information has become a supermarket where people can easily get the things someone else tells them they need. Over the past decade, the unprecedented involvement of technology in people's lives resulted with a growing gap in knowledge between the public and governmental elite. The system is highly advanced in terms of knowing what the ordinary man needs, and the ordinary man does not want to bother thinking about his real needs. One of the most certain proofs of the effects of illiteracy over society is contained in the results from the study Financial Literacy and Retirement Preparedness: Evidence and Implications for Financial Education Programs (Lusardi and Mitchell, 2007). 96% of the surveyed Russians and 70% of the surveyed Americans did not answer correctly on questions related to their bank accounts, interests and inflation. This study revealed the frightening level of financial illiteracy of people worldwide. Such ignorance is dangerous because it shows people are delegating their personal decisions to banks, and they are not interested in the policies that practically govern their lives. The high level of ignorance in society results from ineffective primary education, as well as from the fact that parents do not talk about important things with their children. They are slowly preparing them to get into the system that produces ignorance on many levels. The multi-ideological polarization has its roots in the conscious efforts of governments to overwhelm people with lies and propaganda. The access to Internet and superficial TV programs enabled different interest groups to misinform the public to an unprecedented scale. People are encouraged to educate themselves, but a college degree does not necessarily improve one's literacy. Even though all countries have more Masters and PhDs than ever before, the collective level of political and social illiteracy is disturbing. This trend corrupts not only the language culture, but also the national cultural values. Since literacy is considered to be an expression of the national spirit and identity, the prognosis cannot be optimistic. Illiteracy has conquered the political scene, public institutions, the judiciary system, and even public education. The media have an important role in the global situation: they have long abandoned the traditional journalistic style characterized with truth and clear, brief forms. Today, the language is consumed by the influence of electronic media, and journalists are doing nothing to inform people in a genuine, uncorrupted way. The lack of literacy on the level of language, economy, education, literature, and finance results with the worst kind of ignorance that Bertolt Brecht defined: political illiteracy. People are dragging themselves through decisions they do not participate in. Their choices are based on campaigns and propaganda served by corrupted media that do not present reality. They avoid reading and exploring high-quality literature and publications that require more time than they are willing to give. As a result of modern technology, educational trends and political goals, our civilization is characterized by a concerning level of illiteracy despite the great number of degrees issued on a yearly basis.